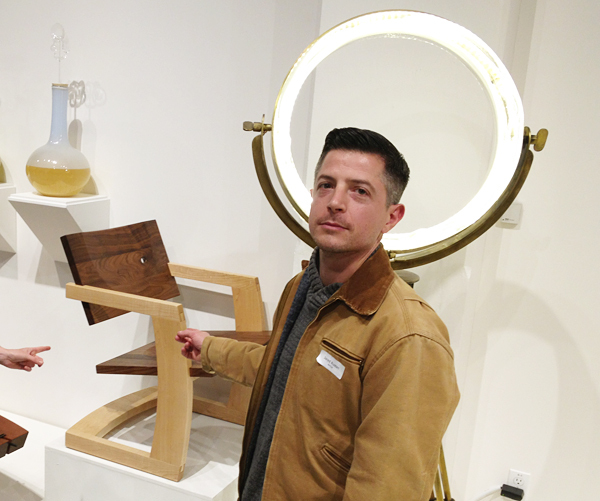 I hope I look sufficiently proud (and not just tired) in this photo, pointing at the new Palo Alto Low Chair on exhibit at the San Francisco Museum of Craft and Design for their current show: New West Coast Design 2. Expertly curated by Kathleen Hanna and Ted Cohen, the exhibit features “dozens of works chosen for the significant contribution they make to the world of design by expanding on the idea of function, exploiting materials, innovative techniques, or pioneering applications of new technology.” I’m honored to have one of my designs among the many other incredible pieces in the show, and I encourage you to visit the museum to see them all through January 14th, 2014. Great thanks to Kathleen and Ted for the invitation! ← Special Edition California table from locally salvaged maple.